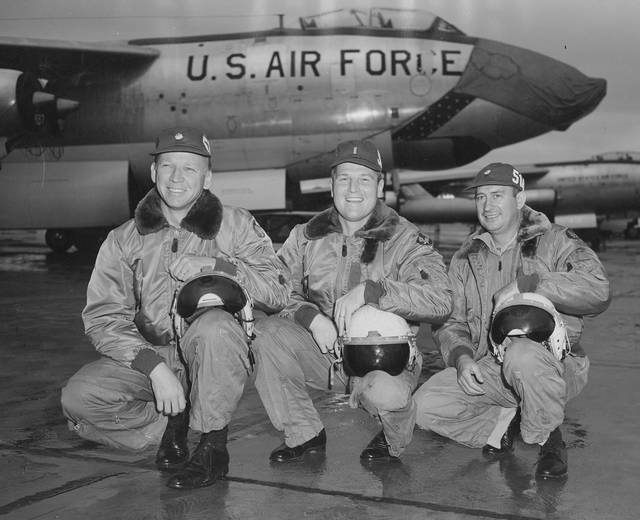 Allen, far left, is pictured at Lockbourne Air Force Base in Columbus with two crew members. The photograph of the trio was taken back in the late 1950s. Pictured is Delaware resident Charles Allen after he was commissioned as a pilot in the U.S. Army Air Corps in 1943. Of the 16 million Americans who served their country during World War II, less than 500,000 remain alive today. On Wednesday, one of those veterans — Delaware resident Charles Allen — became the latest member of the “Greatest Generation” to become a centenarian. Undoubtedly, those who reach the century mark have plenty of stories to tell those willing to listen, but not many 100-year-olds can say they completed a combined 31 bombing missions during WWII and the Vietnam War, and lived to tell about it. In fact, Allen will tell you about two missions, in particular, where his life flashed before his eyes — both as a B-24 bomber pilot in WWII. How Allen found himself in those situations originated from his love and fascination with airplanes, along with his desire to serve his country when it needed him most. The start of Allen’s 30-year career in the U.S. Air Force didn’t begin when he wanted it to as his father threw a wrench into his initial plans. After attending business college, Allen returned to the family farm to help his father. At that time, men of his age were required to register for the draft. “We were farming, and my dad got me a deferment that he didn’t tell me about it, so I had to wait six months (to join the military),” Allen said. “I was anxious to get in as everyone else was getting in. I wanted to get into the service. “I remember I was unhappy with my dad, because he got me a deferment. I should have gone in earlier, but it worked out real good, considering,” he added. Allen got his wish in August 1941, when he was drafted into the U.S. Army. His time in the Army, however, was short-lived as Allen had one dream in mind — flying for his country. “A couple weeks into my time in the service, I received an honorable discharge from the Army so I could re-enlist in the Army Air Corps, which became the Air Force after World War II,” Allen said. After graduating from the Aviation Cadet Program in 1943, Allen was assigned to the 460th Bombardment Group. 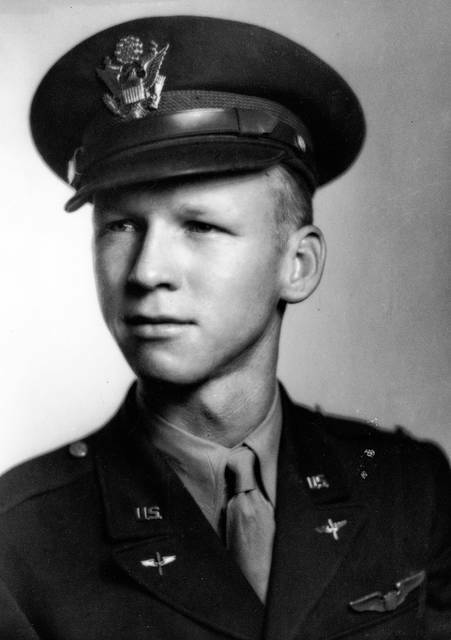 After training at Chatham Army Airfield in Georgia, Allen’s group was sent overseas in January 1944 to a base in Italy. To this day, Allen still has in his possession the original mission log sheet detailing the 14 bombing missions he co-piloted. The log contains the names of the following countries, all of which were targets: Yugoslavia, Romania, France, Hungary and Italy. Allen remembers that day vividly — a day when his life was ultimately spared thanks to a group who viewed Americans as allies. On this particular mission, Allen was co-piloting a newer B-24 that had just been delivered from the States, because his unit’s regular plane was out of service. On their way to their initial target, overcast conditions and no radar prevented them from carrying out the planned bombing, so the crew was redirected to a target in Turnu Severin, Romania. The trouble started after the crew carried out its new mission and was returning to base in Italy. So, all 11 people on board bailed out over the coast of German-occupied Yugoslavia, not knowing what fate awaited them below. The parachute trip from 12,000 feet above ground was quite the experience for Allen. Once on the ground, Allen and the rest of the crew wasn’t sure if they would be discovered by American allies or Germans. It took over a month, but the group did exactly that for Allen and the other 10 guys. To this day, Allen is thankful for the resistance group that helped him and his comrades escape German capture. Just a little over a month after Allen was rescued, he found himself once again in a predicament that nearly cost him his life. On July 6, 1944 — his 14th and what turned out to be his final bombing mission during WWII — Allen was co-piloting a B-24 destined for a target in Northern Italy, which was occupied by the Germans. Struck in the left shoulder, Allen recalled the pain wasn’t that bad, but the burning sensation he felt was something that he will never forget. Had he not been trying to catch a glimpse of the damage, Allen would have been sitting upright, in his normal position as co-pilot. “The flak would have hit me directly in the chest,” he said. After a six-week stay in the hospital, Allen was sent home. While his days protecting the world from the Axis Powers was over, his time in the service was far from through. Upon his return to the States, Allen and his wife, Helen, whom he married on July 18, 1942, settled down together and lived the military life, one in which Allen spent the next two decades holding various titles within the Air Force. In 1965, he got the call to once again serve his country overseas — this time in the Vietnam War as a staff officer on a B-52. After completing 17 missions, Allen was assigned to an additional one-year tour in Vietnam, but this time around he flew C-47s. “We flew supply missions around Hong Kong and Singapore,” he said. Having survived 14 bombing missions during WWII and another 17 during the Vietnam War, Allen continued to serve his country after returning home from Vietnam. After spending time at Lockbourne Air Force Base in Columbus, Allen decided in 1971 — after 30 years in the U.S. Air Force — to hang up his uniform. since 1941, Allen and his wife decided to remain in Columbus, where he sold real estate for a number of years. Delaware resident and U.S. Air Force veteran Charles Allen has lived through a lot over the past century. When asked the secret to living to experience his 100th birthday celebration on Wednesday, Allen said there’s no fountain of youth that he’s aware of. “Every morning I just keep getting up,” he said. Kidding aside, Allen said in his case, it comes down to family genes, and a little good fortune. Allen added two of his three siblings lived long lives as well. He had a brother live to be 92, and a sister who lived to be 84. In addition to being blessed with good genes, Allen said looking back on his life, he did whatever he could to keep stress at a minimum. When one lives to be 100, life, unfortunately, has moments of struggle and heartbreak. Allen’s life consisted of both. During his 30-year career in the U.S. Air Force, Allen saw combat as a bomber pilot in both World War II and the Vietnam War. He dodged near-death experiences on several occasions. In the early 1960s, between his tours in Italy and Vietnam, Allen survived a battle with an enemy that had invaded his body. As for heartbreak, Allen has had to lay to rest both his wife of nearly 60 years, Helen, and their only child. “My wife died in 2001, and my son died in 2010,” Allen said. Nowadays, Allen is thankful to still have a granddaughter and two great-grandchildren left to share his time and memories with.